Helm: Enjoyable. Are we done? Mathew: NO! People need more than that! Helm: Why? Listen to this review... Iron Man 3. Enjoyable. Mathew: That's not a review. Helm: Fine. Iron Man 3, a bit more enjoyable than Iron Man 2, not as enjoyable as Iron Man 1. Go see it if you like Iron Man. Mathew: You're just phoning it in. People are going to think you didn't like it. Helm: No they will not. I said it was enjoyable. I liked it. It was more fun than Iron Man 2. Mathew: Dude. That's not a review. Helm: With the Iron Man franchise it is. There are two kinds of people in the world, those who like Iron Man, who should see this movie, and those who do not like Iron Man, who should probably not see it. Details are not going to persuade anyone out of their bucket. 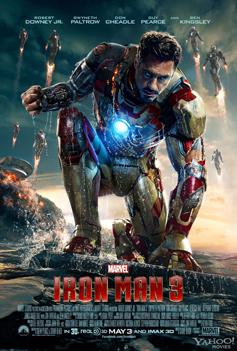 Helm: Well, how about this: Iron Man 3, an enjoyalbe mix of action and pathos, with enjoyable performances, good pacing and numerous explosions. Mathew: You're totally taking all of the fun out of this. Helm: Fine. I found the movie thoroughly engaging. The plot is solid and entertaining with at least one surprise I did not see coming amongst the several that were telegraphed miles off. Robert Downey Jr. turns in another entertaining performance as Tony Stark, although the writers appear to have felt that he needed to be a bit more glib. The effects, action and villains were all equally engaging, although the writers and director appear to have felt that they needed to be turned up a notch as well. As I reflect on the experience, I suppose that the Iron Man franchise is something like an addictive drug. The more you get of it, the more you need in order to deliver the same high. But, with that noted, I would recommend the film. It was enjoyable. Mathew: Cool. That's a much better review. Helm: It is a much longer review. My first attempt would have done an equally effective job of persuading anyone who was seriously considering going to see the movie to go and see it. But with less yaking. Mathew: Whatever. Do you want to know what I thought? Helm: And you are a buffoon. Helm: I am fairly certain that the net meaning of your review would have been "enjoyable". Mathew: I had important things to say about the pathos!